Paragon Drive Backup 9.0 Free Edition, which previously known as Paragon Drive Backup 9.0 Express Edition is a stripped down version of popular full version of Paragon Drive Backup 9.0 Personal (where a variant of Paragon Drive Backup 9 Special Edition is available for free) and Paragon Drive Backup 9.0 Professional. 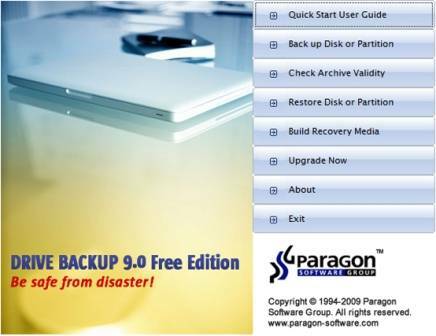 Although Paragon Drive Backup 9.0 Free provides only basic features and functionalities, it’s able to provide easy yet total backup and protection solution, with ability to recover the files when disaster or lost happens. Paragon Drive Backup 9.0 Free Express Edition lacks some features such as no ability to perform backups on CD/DVDs, scheduling backup, no differential backups, can’t excluding files and folders, no dual-boot Backup Capsule, cannot restore individual files, no Paragon Adaptive Restore, no Boot Corrector, no Recovery CD, no Volume Explorer, no simple partitioning and does not support backup encryption. Paragon Drive Backup 9.0 Free Edition is available for free to home, non-commercial users and supports both 32-bit and 64-bit Windows 2000, Windows XP and Windows Vista.